Remember the story about how with Bart’s help I rescued Hank’s History Hour from a WordPress and FTP hack? I finished the story without telling you the final step which was getting it back on line. When last we left our hero, I had the site rebuilt with a shiny new theme and a squeaky clean database but it was all on my own Mac running under MAMP. After I had it all cleaned up, I called the hosting provider, GoDaddy, to burn the old one to the ground. Christian, the GoDaddy rep WHO ANSWERED ON THE FIRST RING, asked me to repeat myself and I explained that it was polluted and had to be scraped clean. I asked what the procedure would be for that and he said it was easy, all I needed to do was open my FTP client, hit select all, and then delete. But then he said he had a better idea. I’m going to pause here to explain why I entitled this story, “This is Not Your Father’s GoDaddy.” GoDaddy as a company has had an awful reputation and with good reason. They had several things that they were doing wrong in my opinion. The first was covering their site with photos of a scantily-clad Danica Patrick, the voluptuous but accomplished race car driver. The second problem with GoDaddy was their level of upsell. You simply could not hit a button on their site while doing any kind of work there without being offered additional services. The GoDaddy CEO Bob Parsons was kind of a creep; he’s famous for having shown boastful photos of himself standing on top of an elephant he shot. They lost a lot of business under his reign. in 2013 GoDaddy named Blake Irving as the new CEO and he hired Elissa Murphy as the Chief Technology Officer and they together promised to change GoDaddy away from a sexist, cheap, annoying business. There’s an article in Wired explaining the transition efforts but I thought it might be more interesting to hear whether this vision has been realized by recounting my own experience with GoDaddy. Now back to Christian at GoDaddy and his better idea. He suggested that I consider a managed WordPress site for Hank’s History Hour. 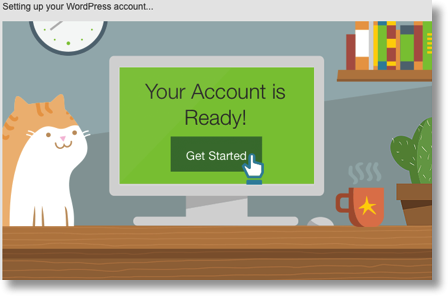 This service would mean that not only would GoDaddy take care of keeping the operating system up to date, they would also take care of updates to WordPress. Remember when I said that part of the hack to Hank’s History Hour was an FTP hack and that it could have slid sideways from someone else’s site on the shared hosting? To combat that problem, on the managed WordPress at GoDaddy, they create your database name and your user name and your password for you so that you can’t be an idiot and make it simple or short. While for my own site I might want more control, that sounded perfect for Hank’s History Hour. On the old shared hosting plan, I only had FTP access, not secure FTP (SFTP) which was another problem. With managed WordPress, GoDaddy gives you SFTP and assigns you your SFTP credentials, again so that you can’t be an idiot. Another threat vector for a WordPress site is plugins. They blacklist plugins. Not only bad ones but ones that wouldn’t really help you like caching plugins since they’re already caching on the server for you. They even automatically perform daily and weekly backups. That’s not important for Hank’s History Hour since it never changes, but for most people that’s a great feature. I figured the trick of this must be that it would be really expensive. I had Hank’s site on the cheapest shared hosting which ran about $6 a month so I was ready for sticker shock. I know GoDaddy, here’s the upsell for sure. However, Christian explained that it wouldn’t cost us any more money because of introductory pricing. It sounded too good to be true, but it actually got even better. 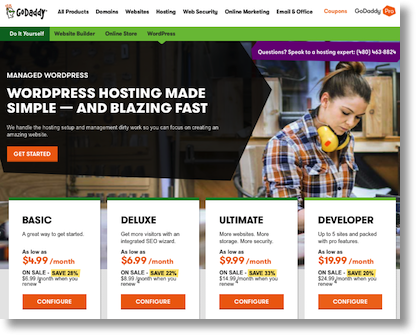 I went out to GoDaddy’s site and looked up their managed WordPress offering (godaddy.com/hosting/wordpress-hosting) so I could see in writing what we’d be getting for the money. That’s when I discovered that there was an even less expensive plan! Now here’s where Christian could have done a bit better, he didn’t tell me they had a $4/month plan. He could have asked some more questions about the needs of the site before deciding which one we needed. I’m going to let him off the hook for this because as soon as I talked to him about the lower plan he was all over helping me get that one instead. He went on to explain that it might be a good idea to buy a few year’s worth because I could lock in the introductory pricing since it goes up $2/year if you don’t. He suggested 5 years, I suggested 4, he said he could do 3 not 4, and then I thought, what the heck, he’s been great, it’s a tiny price, lets go for 5 after all. For $4/month we got 10GB storage, 25K monthly visitors, SFTP and a free domain name. Christian also explained that if later we needed more we could always upgrade and it would all prorate. I don’t think there’s going to be a sudden surge in interest in AP European History any time soon but it’s good to know. I should mention one thing, it appears that I got in on a sale, because the pricing online is now showing every plan $1 higher than what I was quoted. Note that at no time did Christian say, “BUY NOW AND SAVE!” or anything like that. The other crazy thing is that the GoDaddy site had no half naked women, no blinking spammy crud to annoy me, just the pricing. I’ve been yapping about the pricing for long enough, the process to move the site was even more interesting. I know this might be offensive to the more technical of you listening but I thought it was pretty cool that they made such a painless interface for less technical people. After this was done we needed to connect Hank’s domain to this WordPress site. Christian walked me through the screen where a pulldown was available to select hankshistoryhour.com to connect it to this new server IP. It took a while for the old site to give up the name but eventually I was able to change the name over. In the mean time I was given a temporary domain name so I could start using SFTP to upload the content to the new WordPress site. A WordPress installation includes several standard folders, one of which is called wp-content. It’s in this folder that the theme I worked on would go and any plugins and uploads like graphics and the mp3 files for the podcast. Christian was still with me, ane he explained that he would rename the wp-content folder, and then I could upload mine right into the WordPress site. Next, using MAMP as I described earlier, I was able to go into the database administration tool phpMyAdmin and export the database. That’s the file now that has all of the nice shiny clean blog posts and comments. I don’t need to use XML any more because I can create this clean database. Christian told me to transfer that database file up to the server at the root level and he would literally push a single button on his end and it would not only import the database into Hank’s new site, it would fix the URLs. Since I built the site locally, “home” wasn’t hankshistoryhour.com, it was localhost blah blah blah. In one hour, from start to finish, Hank’s History Hour was brought back to life in its new and improved modern form. GoDaddy found me a solution, sold me the solution without upsell, didn’t try to add any more glop to the account, and executed the creation of a WordPress installation with all of our data. I have to say that it was a perfect experience with GoDaddy. If you ran away from GoDaddy because of their constant upsell, their creepy CEO and their appalling website, I would encourage you to give them another try. Remember, they answered my tech support call on the first try. Thanks, Allison. That really is a new GoDaddy. I had used them to register several domain names in the past, but I had never used them for hosting a site for the same reasons you felt uncomfortable with them. I currently maintain two WordPress sites (one a mirror of the other) at another hosting service (who have actually been very easy to deal with). That hosting service, however, doesn’t offer this level of a managed service. Your posting would cause me to reconsider if I start another WordPress site in the future. Thanks for this information. I’m sorry but I have to call you out on one thing Allison. You said “…the voluptuous but accomplished race car drive” The word ‘but’ is a conjunction that means “on the contrary”. It is not contrary for a voluptuous woman to be an accomplished race car driver… just rare because there are so few women drivers. Honestly I’m just messing with you. I know you meant nothing of the sort. Blame my Pastor. He says “but negates everything before it – ‘I’m sorry but…” Guess he has a point in many cases. Thanks for the tip that GoDaddy is changing for the better! It will be fun to see how far they get under different leadership. I looked up “but” in Google and here’s the first definition which shockingly reads like what I meant. “And yet” might have been a more elegant way to say it but it looks like your Pastor may have been mistaken? 1. used to introduce something contrasting with what has already been mentioned.